Fences divide our personal territory—yard from yard and home from home. 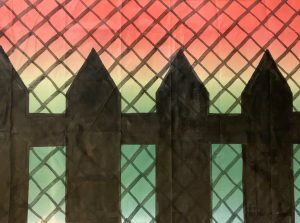 Barriers have exponential implications for the current political debate over America’s national borders and “The Wall.” Yours, Mine, Theirs explores these issues through the use of fences which overlay and obscure idealized color gradient backgrounds. On one side of the flag, a color blend is seen through the silhouette of a picket fence, as if looking out from one’s personal space. On the reverse side, a similar situation exists, however the view this time is through a chain-link fence, a form more closely associated with restriction and used within jails, by private corporations, and to establish geographic borders. A dichotomy emerges on the surface of the flag; each barrier holds a distinct viewpoint and perspective. Expanding the physical scope of barriers, Yours, Mine, Theirs urges viewers to consider their relationship within such a physically divided space, and the symbolism inherent within such isolation. While the relationship of private space and the use of fences to separate land is ubiquitous, the specific type of fence used, whether picket or chain-link, has specific connotations in this political moment. Yours, Mine, Theirs calls into question the division of land and territory today, and the necessity of it. The result is a flag that flies as a resolute act to draw viewers into a personal examination of these issues. Matthew McLaughlin is a mixed media artist whose work explores the human relationship with environments, specifically urban and suburban spaces. He received his BFA degree in Fine Arts from Ringling College of Art and Design and his MFA degree in Printmaking from Arizona State University. Matthew has held solo exhibitions in Washington, DC and Phoenix, among other locations. His work has been included in group exhibitions, both nationally and internationally, in commercial galleries, artist-run spaces and museums. He has received numerous awards including the Maryland State Art Council Individual Artist Award 2016 in Works on Paper. His work is in the collections of the Zuckerman Museum of Art and various university’s, along with private collectors. Along with his personal artistic practice, Matthew is an emerging curator in the Washington, DC metropolitan region. His exhibitions have focused on bringing together the artwork of emerging artists that explore similar themes to his own research; such as, but not limited to, satire, irony, landscape, space, and environment, along with specific mediums, like graphite and printmaking. STNDRD Presents: Dream Wavers at Loyola Marymount University, Los Angeles, a special off-site outdoor exhibition guest curated by Katie Kirk with STNDRD. Flags fly in this expansive outdoor exhibition of waving signals, but the works in Dream Wavers break with conventional vexillography. Instead, this group show celebrates diverse approaches – through subversive content and materially experimental interpretations of the flag. An oversized hand, a pair of American flag trousers, a wreath of flames, and a flag of napkins all challenge traditional notions of flag design and explore the edges of possibility. 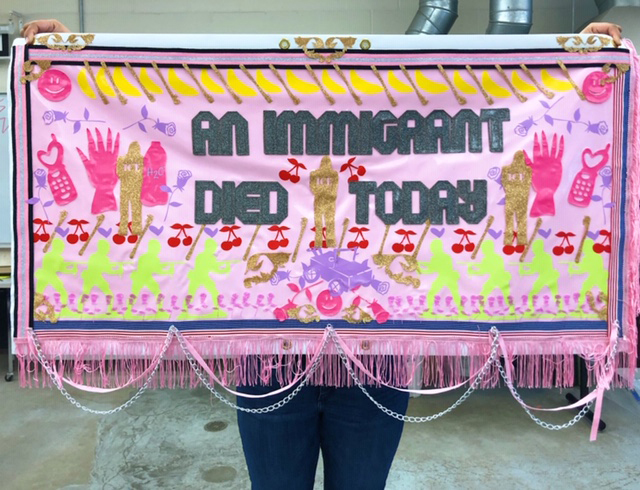 Twenty-four artists from across the US offer a range of distinct perspectives on identity, particularly in the current political and social landscape. Dream Wavers explore fissures and confluences–both personal and public–calling attention to vanishing communities; critically assessing urbanism, human rights, and political challenges; or quietly gesturing to remote histories, myths, and personal symbology. The act of raising these flags is a gesture of unveiling and revealing–to amend, renew, and support our present moment and our possible futures. Katie Kirk, co-curator of the exhibition, is a Los Angeles-based artist, curator, and writer. She works primarily in painting, monoprinting, and ceramics, exploring ideas about pleasure and the role of pleasure in art and life. Her work is deeply connected to documenting the human body and all its capacity. Katie received a BA in Film and Television Production from Loyola Marymount University and an MFA in Painting and Drawing from the School of The Art Institute of Chicago. Her work has been exhibited at the Irvine Fine Arts Center, Torrance Art Museum, Pennsylvania State University, Open Mind Art Space, EXPO Chicago, Flatland Gallery, Jacob’s Los Angeles, and Arvia LA. She recently curated shows at the Torrance Art Museum and Dalton Warehouse and is also a contributing writer to Maake Magazine. The Laband Art Gallery is dedicated to presenting exhibitions and public programs that illustrate that the visual arts are a critical component of society. As a university art gallery, the Laband features exclusive exhibitions that may not be found in other civic or private museums. In doing so, the gallery showcases art that has relevance across multiple disciplines as well the broader community.Laband exhibitions and related programs promote inquiry, creativity, and critical reflection that further a growing awareness of ourselves and of the world around us. Dream Wavers is located in the Dunning Courtyard of the Burns Fine Arts Center at Loyola Marymount University, which is the main arts center on campus. It is an outdoor installation that is open and accessible 24/7.